1) Bring a large pot of water to a boil. Add tortellini and cook according to instructions on package. Drain well. 2) Heat vegetable oil in a large skillet over medium heat. 3) In a large bowl, combine panko and parmesan then set aside. 4) Working in batches, dredge tortellini in flour, dip into eggs and then dredge in panko mixture, pressing to coat. 5) Add tortellini to the skillet, 8 or 10 at a time, and cook until evenly golden and crispy. Transfer cooked tortellini to a paper towel lined plate. 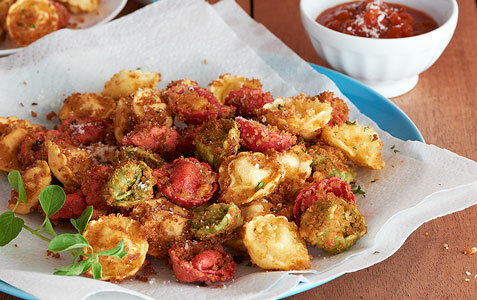 6) Serve immediately with marinara sauce and garnish with ad,ditional parmesan. 2) Slice jalapeños in half lengthwise. Using a spoon, scoop out the seeds. 3) Mix cream cheese and Wholly Guacamole dip together. 4) Stuff each jalapeño half with cream cheese mixture. 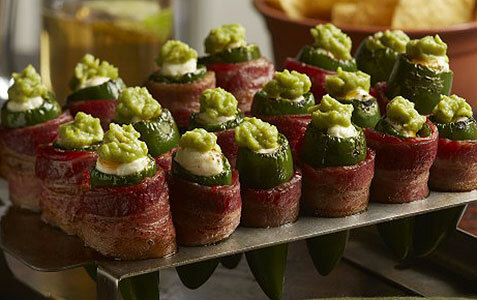 Then, wrap a slice of bacon around each stuffed jalapeño half. 5) Place stuffed jalapeños on a medium baking sheet. Bake in oven for 20 minutes. Using tongs, turn over and cook for an additional 20 minutes or until bacon is fully cooked, browned and crispy. 1) Season the wings with salt and pepper. 2) Heat the oil in a large pan or skillet to 375 degrees F.
3) Fry the chicken wings in oil for about 10 minutes or until done. 4) Remove chicken and drain on paper towels. 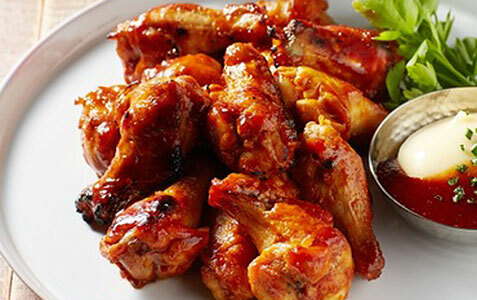 Finally, toss the cooked chicken wings with your choice of Bibigo gochujang sauce and enjoy.